The most common thread profile is the simple V thread, with opposing faces of the thread forming an angle of 60°. This thread angle is a compromise that balances the efficiency, wear rate, strength, and most importantly, the friction of the threads. Along with the pitch, or number of threads per unit length, thread friction contributes to the self-locking, or “non-overhauling” property of most screw threads. Self-locking threads easily convert a rotational force to an axial force, but not the other way around. It’s easy to see this property in action — a nut spins easily on a screw with finger pressure, but push the nut as hard as you can along the long axis of the screw and the screw will not start spinning. Self-locking keeps tools like screw jacks from unwinding under load. 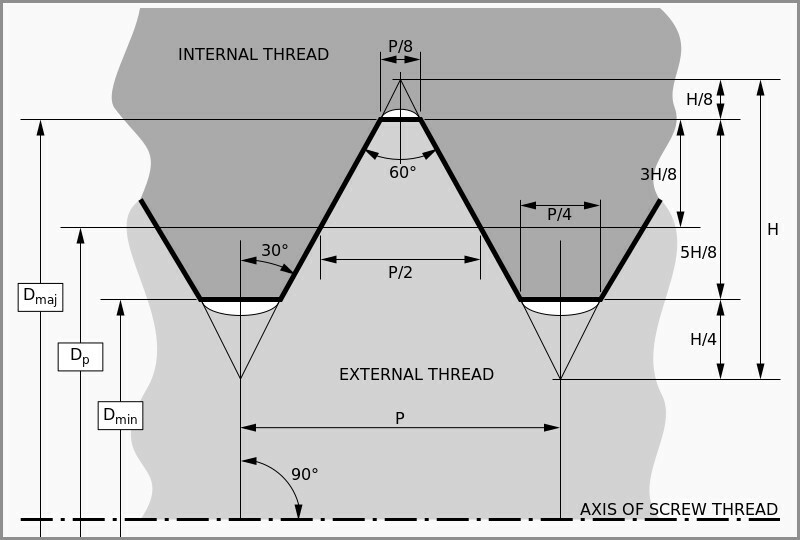 Screw thread profiles can be modified from the standard V profile for better performance under different loads. The Acme profile, a trapezoidal shape with faces forming an included angle of 29° and with large flat crests and roots, is particularly suited to high-load applications like vises and clamps. It’s also found in lead screws such as those used in linear actuators found in everything from DVD players to CNC machines. The Acme profile is also found in the lead screws of most metal lathes because it works well with split nuts. Split nuts are just what they sound like — an internally threaded element that has been split lengthwise and can be opened and closed around a lead screw. This is used to advantage in thread cutting operations, which the split nut closes around the lead screw at the start of thread cutting and opens at the end of the cut, starting and stopping the movement of the cutting tool against the workpiece in repeatable locations. For precision threads and low-volume production, cut threads are common. Cut threads are produced in either a lathe or a CNC machine by removing material to form the thread profile, either with a thread cutting tool translated lengthwise against a rotating workpiece, or with a tap (for internal threads) or a die (for external threads). Cutting threads is time-consuming, though, so for mass production, external threads are generally formed with a rolling operation. A forged blank is clamped tightly between a pair of grooved dies, one of which is stationary. The opposing die moves perpendicular to the long axis on the blank, pressing the thread profile into it. Since no material is removed from the blank and because the material is work hardened, rolled threads can be stronger than cut threads. The rolling process is also automation-friendly, and rolling machines can produce thousands of parts per minute. The internal threads of nuts don’t lend themselves to rolling, so most mass-produced nuts are formed with a hot forging process. Hot slugs of metal are struck by dies that form the head profile and punch the center hole. Later, the cooled blanks are sent to a tapping machine which cuts the internal threads using a tap. There’s much more to screw threads than this quick tour, of course. The simplicity of screw threads and the ubiquity of threaded fasteners belie the physics behind these mechanisms, but understanding the basics is a great place to start. Ah, screws, where imperial and metric live together in harmony within the same standards.. Whichever you choose, your still screwed? Ah, screws, made good in Manchester! ACME screwed the coyote a number of times. But he did it 29° off axis. Let it be noted that the first who coined “screw you” and “nuts to that” took a turn for the worst. Somewhere an archaeologists is digging up the very first screw, and nut. I suffered a Eureka moment when contemplating 3d printing a screw the other week. All threads are a non concentric circle that linear extrudes with a rotate per layer. With that in mind, a spreadsheet and Openscad linear extrude makes any thread easy to make. Good one, I hadn’t thought about googling it as a circle works fine for everything I have done since but worth readong about. I would have liked to see a little about the history of threaded fasteners – they were once incredibly rare because we hadn’t developed ways to make them in quantity. I’m, of course, meaning after the relative ubiquity of metallurgy but before the screw became what it is today. How true; thank you for saying this up-front. One “screwy” topic often overlooked is multi-start threads (a.k.a. multiple-start threads, Google the terms). One place you commonly encounter multiple start threads is when you screw/unscrew the cap on a high-quality Fountain Pen. Often a fountain pen cap and barrel will have mating threads that have two or more (often three) starts. Increasing the number of starts preserves the number of threads while decreasing the number of turns it takes screw or unscrew the barrel from the cap (which is more user-friendly). Preserving the nunber of threads helps to maintain the integrity of the cap-barrel seal against unwanted ink leaks while reducing the number of turns need to screw/unscrew the barrel and cap. Using rotating machines, it is more complex (costly and time-consuming) to mill multi-start threads, especially the inner-threads found in the cap of a fountain pen. Tooling costs increase significantly if the multi-starts threads are to be milled in one-pass instead of multiple passes, one per thread. If anyone has an example of the lathe tooling required for multi-start threads in ONE pass, chime in – especially if you have an example of chasing INTERNAL multi-start threads. How about the occasional times when the rolling machine messes up and makes a zero-start “screw”? I’m having trouble finding photos, but I’ve seen them in person, and they’re great for a laugh. They call them car keys. bottom of the page, multi-point inserts can be used for multiple start threading both interior and exterior threading. They do require more control over your machining environment but ive seen them used before. No, it says right on the page the multi-point inserts are so you don’t have to make as many passes. you can see the idea of what i mean. in the milling tool all of the teeth are of equal depth and you set your helical tool path based on your thread pitch desired. I have seen turning tools with even length teeth but they were in a specialty tool catalog for softer materials. Thread milling has generally taken over in CNC operations, both in hmcs and vmcs. A CNC lathe with live tooling and the right cam software can churn out internal multi start threads with very little trouble. The trouble comes in being able to afford one! Had my first try and making an internal thread on a part with a custom tool on the CNC machine. Now I am wondering why I even bothered had tapping any threads :) although the forming tools are not cheap the finish is perfect every time. Doing threads on a non-CNC lathe is easy. There should be a setting for threading and a little counter so you can start the threads perfectly timed every time. We have a Tormach CNC lathe and it’s awesome for threading by we also have a Grizzly gunsmith lathe what works great for threading as well. Most common use of multi-start screws is probably jar lids. It significantly reduces the difficulty in locating the lid correctly to start screwing it on. Double thread screws are made to go in quicker in assembly time. I have had Italian made organs use these in the pedal board holding the spring tension in the metal springs. If they go in easier with more “ramp” they come out by themselves even easier! Junk! In order to save a few seconds we have self disassembly that continually falls apart. We’re screwed. Leonard: What would you be if you were attached to another object by an inclined plane, wrapped helically around an axis? on exterior threads i would agree, on interior threads you might have a harder time convincing people. That being said, there are other methods to bring strength back into the part through heat treating or anodizing. Also if i were to build anything, then i wouldn’t be threading the nuts or bolts at all. Instead i would be buying them based off of bolt grade, the interior threads into billet components would also be designed in such a way that the forces acting upon the bolt are not in an axial direction but in a radial direction. thus putting significantly less stress on the threads of the bolt and instead uses the threads to maintain tightness. That’s like saying never use aluminum because it will break before an identical steel part. Just design it properly for the forces you are handling and the materials you are using. If your bolts are shearing, you’ve designed it wrong, as screws are never supposed to be carrying shearing loads – the parts you clamp down with the bolts are supposed to hold together by the friction of the clamping force. Maybe someone here will be able to help me. I am looking for a formula or on-line calculator or some hint how to calculate the following: I want to attach electric motor to a pair of rods with thread and I want it to lift lower around 100kg in around 1 m range. Distance between rods will be aroound 1-1.5m . Stability will be provided by other means. Problem is: i don’t know how should I choose engine (power) and thread parameters. Any tips? Here’s a hint: pitch * RPM = speed. From your travel speed and gravity, you can calculate the potential energy gained in the lift and hence the motor power. Don’t forget friction though as it may dominate unless you use a thread profile that is actually designed for this purpose, and the threads must be properly lubricated. 5mm pitch * 1000rpm = 5000mm/min = 0.083m/s. 100kg * 9.81N/kg * 0.083m/s = 82W. Actually, the efficiency of the thread will need to be below 50% if you expect the thread to be self-locking. Significantly below 50% for practical purposes. In 1978, my wife and I toured the “Treasures of Tutankhamun” exhibit at the LA County Art Museum. As a non-American I would like to add some info. Firstly threads have a mesh ratio. This is from the gaps shown in the “V” thread graphic in the top of this article. If you had no gaps then the mesh ration would be 100% and the screw would bind solid. The size of a screw is the size that would have been 100% mesh so your 1/4 inch screw will fit into a 1/4 inch hole with a small gap. There are 3 common standards for machine screws. Metric – A M2.5 screw fits in a 2.5mm hole with the gap mentioned. Some metric screws are available with both a course and fine thread. British Standard Whitworth (BSW) – A very common standard in the building industry but not common for machinery. Threaded rod is often Whitworth. 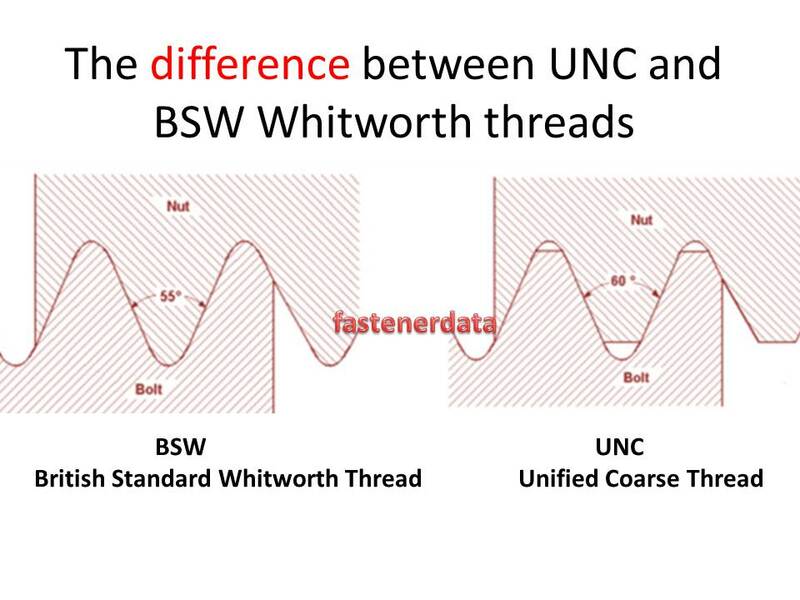 Unified Thread Standard (UNC) (UNF) – The “C” in “UNC” is for course thread and the “F” in “UNF” is for fine thread. This standard has some peculiarities. THE UNC course standard was created before the UNF fine standard so there are some fine threads in the UNC standard that may catch you out. The other trap is the numbering system changes. Bolts of 1/4 inch and above are simply numbered by their size ie 1/4 inch bolt. Bolts below 1/4 inch have a different numbering system like the #4/20 screws in you desktop computer. The first number that is preceded with the “#” symbol is the size expressed by the equivalent sheet metal gauge thickness instead of a fraction of an inch. The second number is the Threads per inch (TPI). So a #4/20 screw is the size of number 4 gauge sheet metal minus the gap mentioned above and has 20 threads per inch. I haven’t had to learn anything about UNEF because where I am almost everything is metric especially with fine threads. I wasn’t even aware of UNEF. Nope, number size screws are not the sheet metal gauge in size. Yes they are but they are not an American standard. They are based on the Swedish standard created by Brown & Sharpe during world war 2 for sheet metal (not to be confused with wire gauges which are different). Sorry, this relates B&S sheet metal gauges to British Association Screws (BA) rather than UNC/F. Depends on what you call a gun – I think of them as machines. Many barrel threads are Whitworth – including those for the fantastically common German Mauser. You can almost make 60 deg threads fit – with a file by cutting some of the tops off…but this is a case where it’s a lot better to do the correct thing. While the discussion has been about screw design and standards mostly, I feel compelled to mention how I solved a problem with screws. The case screws on a Honda XR-80 I used to own kept coming loose, even with just one ride. I added some silicone RTV to the threads, and they never came out without a screwdriver after that. (I know, Loctite is made for that, but I already had RTV). The chain had damaged the case in front of it, and would let dirt in to contaminate the points. I used some thin sheet aluminum over the hole, and RTV to hold it there, and didn’t have to replace the points after that. As a kid that was a good thing because the local Honda dealer charged $50 to install a new set of points. I happen to work in the automotive industry and deal with this kind of issue regularly, using loctite or similar is actually a poor solution as it may just be hiding the problem which could come back to bite you when you least expect it. When tightening a bolt, you’re converting torque to axial tension, this tension forces the components together, and friction between the components is what’s actually holding everything together. If that tension should drop to zero, the friction between the components also drops to zero, allowing them to move around which could eventually lead to fracture of the bolts or components. If you apply loctite to a bolt that keeps working loose, all you’ve done is stop it spinning, it may still have lost all it’s tension (this can happen for a number of reasons which I won’t go into…), potentially leading to catastrophic fracture, though bolts can usually take quite a beating before that happens. More often than not the culprit is either compressible material in the joint (e.g. paint, plastic or dirt) or insufficient torque (which may require a higher grade bolt to improve upon), however there’s many odd reasons. Interestingly, the solutions are often counter intuitive, e.g. going down a bolt size is sometimes the answer! The majority of bolted joints rely on the clamp force which is generated by the torquing or tensioning of bolts to sustain the forces which are applied. The inclusion of a gasket in a joint to prevent leakage is only effective as long as there is sufficient clamp force generated by the bolts to allow effective sealing. 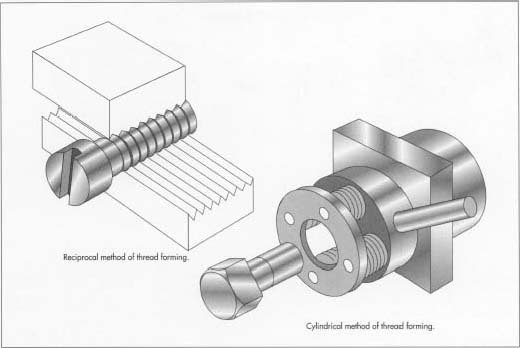 With forces applied to the joint, the forces are transmitted by friction as a result of the clamp force generated by the bolts, leading to a secure bolted connection. Thread stripping can be a problem in many designs where tapped holes are required in low tensile material. In general terms, thread stripping of both the internal and external threads must be avoided if a reliable design is to be achieved. If the bolt breaks on tightening, it is obvious that a replacement is required. When a bolt is being tightened, two threads are mated together, which leads to the tightness of the bolt. When the two threads are mated together, a shear stress is applied across the threaded section. If this stress becomes too high, the section will shear. This is known as thread stripping. Thread stripping internally strips parts of the internal thread itself and becomes embedded around the external thread. This type of bolt thread stripping is very serious, and must never be allowed to occur. Its occurrence is a certain sign that there is something seriously wrong with the bolts. If it is observed, the bolting procedures must be re-examined and re-evaluated immediately. If it is allowed to persist, serious consequences may result because the bolts will not only sustain a preload, but external loadings may be transmitted directly to the bolts and cause joint failure. Fatigue failures typically occur within a couple of threads, where the bolt engages into the internal thread. Failure is then reached due to the high stress gradient within the region. Fatigue failures can be particularly hazardous because they often occur with no visible warning signs and the failure is often sudden. Fatigue failures are often unknowingly avoided in gasketed joints simply because the required crush for the gasket often dictates a torque or bolt tension that minimizes the risk of a fatigue failure. However, changing to a new gasket type later on which requires less crush may be the initial cause of bolt fatigue failure. It is not unusual to assume that a bolt has failed due to overload when it has in fact failed from fatigue, which can also be a consequence of self-loosening. Bolt overload is a result of the applied force being sufficiently high causing the bolt to fail due to overload. This is a direct result of the axial force being applied acting upon the bolted joint, which then causes the bolt fractures in the threaded area. Bolts are typically made from high strength steels, which when fully tightened, exert high clamp force onto the joint. The area directly under the bolt head or nut face sustains the high bearing stress. If a maximum stress limit for the joint material is exceeded, then deformation occurs over a period of time. This leads to the extension being lost in the bolt, resulting in the clamp force subsequently being reduced. Bolts are considered to transfer force between the connected members, one of the ways bolts transfer force is called bearing. The bearing method assumes that the bolt contacts the side of a hole and there is a compressive force between the bolt and the side of the hole. The magnitude of this compressive force is limited by the strength of the material to handle this compressive force. Steel after all, is a Chrystal structure. It has many hackable features for the engineering staff to explore. And in all this so far, no mention of materials science behind the stock used to manufacture the product. I wouldn’t want to be using a screw made out of metal that could rust on an outdoor deck. The tensile strength of the material is as important as the type of pitch, mesh, etc of the screw itself. No mention of the shear strength or elasticity of the materials. No mention of the corrosion treatment processes. No mention of the varying levels of quality control – hint, I wouldn’t be using cheap china grade screws on my homebuilt experimental aircraft. Aviation grade screws are a whole new world onto itself. Wait, did you just say, “A cheap Chinese screw”? Better check your supplier. There are a lot of chinese fasteners out there, even a TSB. Nice write up, but you skipped right past the reason Acme threads exist. The most precise and repeatable thread to drive a load with minimal backlash (as desired on machine leadscrews) is the square thread. You’ll see square threads on all early 20th-century American machine tool leadscrews. However, square threads are very difficult to make, because the cutting tool has no relief area; the sides of the tool will bind up as the thread gets deeper. Acme was created as a compromise. It provides just enough angle to give cutting tool clearance during manufacture, while still mostly retaining the desirable properties of a square thread for driving a load.